Home » American Politics » Trump Finds Solace in Campaign-Style Rally. How do you tell the President election is over? Trump Finds Solace in Campaign-Style Rally. How do you tell the President election is over? President Trump election-campaign-styled rally is a bubble away from reality. The reality of the power bestowed on the President of the United State, the share responsibilities and expectations have well and truly settled in. president Trump by now has realized that arm-chair or tweeter criticism of President Obama is at best oblivious or ignorant of the realities. Remember the reaction to President Obama Afghanistan military deployment? at least, tweeter cannot un-tweet this. Trump has just re-affirm that very same policy. Following Eight months of chaotic reigns, what can best be described as shambles in the White House, the president turned to his core strength, the “election-campaign-style-rally”. Well, it will take someone with extreme pathological cognitive dissonance condition to contend that Trump’s White House is anything but a shamble so far. Trump changed the dynamics of communication by bypassing the media to using Social Media, this has worked both for and against him. It seems, however, that his daily tweeter feeds and White House briefing are no longer enough to drive his message home to his supporters. Last night, Trump heads to ARIZONA for a rally delivering a speech that sounds exactly like his pre-election speeches. The rally so named “Make AMERICA Great again” where he accused the opposition party of being an obstructionist, the media of handing platforms to hate groups and turning blind eye to the violence on the street. 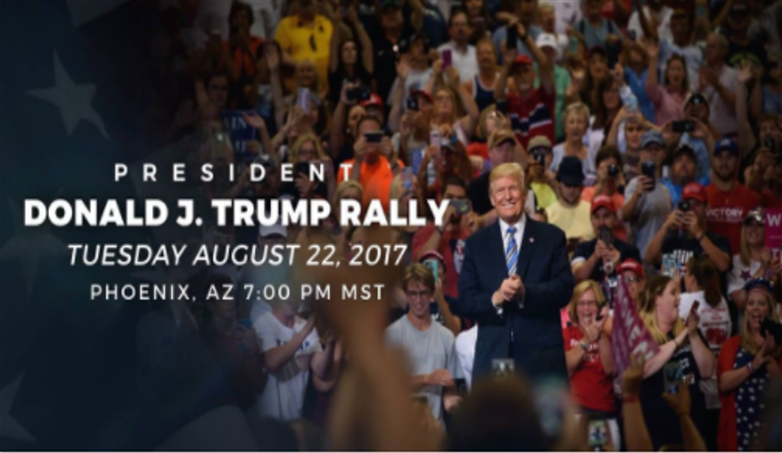 This is not the first of such rallies post-election but following a particularly bad couple of months that saw the employment and sacking within ten days of White House communications director Anthony Scaramucci, failure to successfully repeal and replace ObamaCare, poor and plummeting approval ratings and the handling of Charlottesville, this Arizona rally is by far the most significant and important to the President because it is as if he needs a renewal of his mandate. He wanted to see or measure first hand the level of support he still enjoys out there. Re-ashing the election mantra in Arizona, that can be described as a Trump Heartland where he took all the eleven available electoral votes is perhaps not the best place to measure a nation-wide representative level of support, however, it will be enough to gather a crowd to fill a venue from the over 1.25m people that voted for him. Starting his speech with opening line of unity, reminding the nation that they are on the same side and encouraging the nation to love one another but quickly descending into defence of his position at Charlottesville, referring to his speech as a “perfect” speech but conveniently omitting the line that blames “many sides” speaks volume of the mindset of someone who is at odd with reality. A call for unity and a divisionary blame game all in one 80 minute speech is indeed very odd, but he finds in the crowd an adulation he so much desire. Gustave Le Bon theorized that crowds are divorced from their social context. His theory assumed that crowd participaton extinguishes our normal psychological capacities and reveal a primal nature which is usually well hidden from view. With due respect to Trump adoring supporters at the rally, Le Bon theory is well crystallized here. Trump was not prepared for the challenges he faced in the White House, translating his business successes to governing a nation like the United State, something he believed he could do easily has been more difficult than he expected, instead of changing tactics, he compounded his situation by escaping into a bubble. His supporters exist in the same bubble with him, in the bubble any criticism is either a fake news or from a sulking Democrat who had wished Hilary Clinton won. In this bubble, a false reality is being created, residents of this bubble are more at home with alternative narrative and finds repulsive any counter narrative, regardless of the facts. Uniting the Nation is by taking actions towards doing so, not slicing, dicing, changing and omitting words said in response to a sensitive event that claimed three lives. The crowd in the Arizona rally may have come out to adore every single word pronounced by the President, they may have clapped and risen to their feet at every sound bite, but the primary work of governing a nation has not disappeared. After the rally, President Trump will return to the White House, where the reality awaits him.